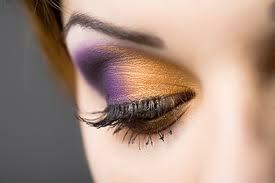 Whenever I apply my makeup I like to apply my eyeshadow first before I put on anything else. No concealer, no foundation, no powder etc ,eye makeup first! This gives you the ability to clean up any fallout or mistakes w/o ruining your face makeup. You can simly just take a makeup wipe remover & clean up your mess-up! After you are comepletely finshed, go ahead & apply makeup to that beautiful mug of yours!